Morning routines are the best but, for me, nothing beats a good night time routine. The time where you are getting ready to throw yourself on your lovely bed and get rid of all the stress that a work day gives you. Saying that, I decided to come up with five things to do before going to sleep. Things that will relax and definitely improve your comfort and rest over the night. Not only brushing my teeth is a must-do but also cleansing and washing my face is a step I cannot skip. Even on a day that I don’t wear any makeup, I always wash my face with my favourite cleansing lotion by No7 as I like to get rid of all the impurities and let my skin breathe over the night. This really relaxes me as I feel like I am releasing all the bad energies that got me during the day. Since I discovered the joys of a good skin care routine, I have been keeping up with it for as long as I can. Not only you will notice major improvements on your skin condition but it also feels very soothing and relaxing when doing this before going to bed. I love it. I am not the kind of person that likes to go to bed to sleep straight away. I know that that is what you are suppose to do but I guess the majority of the people don’t do that anymore. Instead, I love spending a few minutes (or half an hour) doing something I enjoy and that relaxes me. Sometimes, I just go through all my Snapchat stories as that just takes my mind of anything that is stressing me out. I also love to read. 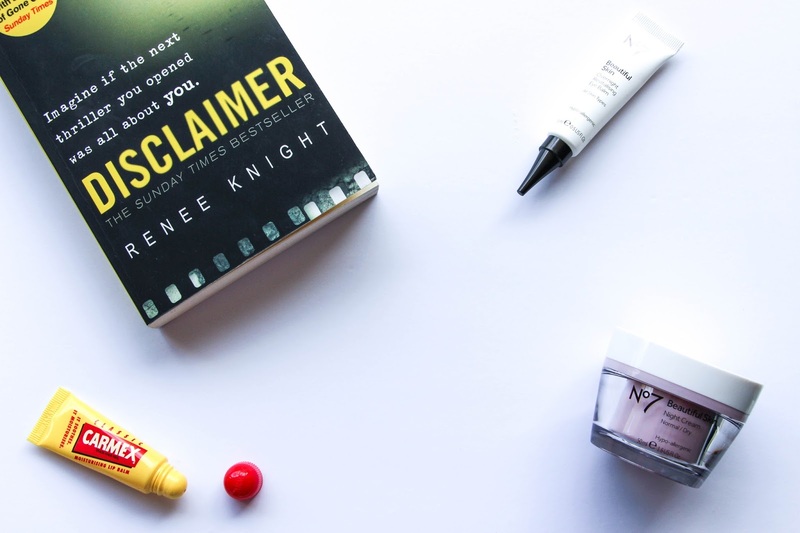 I discovered that I love reading thrillers and so I am currently reading “Disclaimer” by Renee Knight. There might be a post on this book next week, lets see. Doing something that takes my mind of my problems or concerns is always something good to do before going to bed. Although I am not a tea person, I do love my lemon tea with a bit of lemon juice. I don’t know if or why it is beneficial for you but all I know is that there is nothing better than having this cup of tea while still in bed reading or watching my favourite TV show. It warms me up during these cold nights and really calms me down. I love it. I know this won’t be everyones cup of tea but I do love listening to music (classical or acoustic) when I am trying to go to sleep. During my early years of uni, I used to struggle a lot to fall asleep and music was something that really helped me out. Now I have a boyfriend that does not like music just before going to sleep and so I don’t do this as often – also because I prefer to cuddle with him and chat about our day haha – but for me, music is the most relaxing, calming and soothing thing ever. Again, it makes me focus in something else and it really makes me travel and helps me to have a nice, deep sleep. Last but not least, an extra little big thing: always kiss goodnight. Your boyfriend, girlfriend, husband, wife, parents or brothers – always kiss goodnight. You never know what tomorrow will bring. What are your favourite things to do before going to sleep?